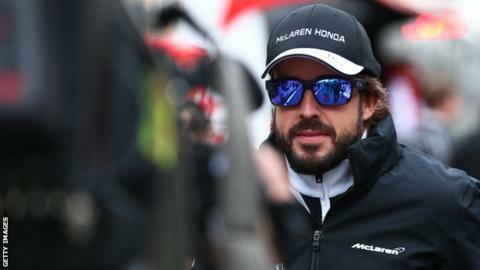 Fernando Alonso says he has no regrets about his decision to leave Ferrari to join McLaren this season. The 33-year-old two-time world champion, who left Ferrari after five years without a title, saw replacement Sebastian Vettel win only his second race for the team last month. McLaren, meanwhile, are struggling to compete in the early months of their new engine partnership with Honda. "I am happy with my decision," said Alonso. The Spaniard finished second in the championship three times with Ferrari - in 2010, 2012 and 2013. He added: "There have been years when we started very well, Ferrari, but when it counts is November (at the end of the season) and when it was November we never won. I want to win in November." Alonso has won 32 grands prix - sixth in the all-time list - and has made no secret of his desire to win at least one more championship. But he said he was enjoying being with McLaren-Honda at the start of their revived partnership. "I would like to win because we are sportsmen and all competitive but also at my age and the moment of your career you start looking for other things," he said. "I have been lucky enough to win championships and many grands prix and now sometimes I feel happier and more proud of my job and the team doing the things we are doing now than winning a trophy. " McLaren-Honda's preparations for the season were hampered by poor reliability in pre-season testing and the engine is still substantially down on power compared to its rivals. Alonso also missed the first race in Australia after crashing during testing in Barcelona. "Being behind in testing means there is a high price to pay in the early races but the steps forward we are making are quite positive and are the right ones," said Alonso. "I don't think we are lost. It is a question of time before we are competitive and hopefully it will be sooner rather than later." Alonso also implied McLaren, to whom he is contractually committed until 2017, would be his last team in F1. He said: "I started with a McLaren-Honda when I was three years old - a replica made by my father - and I finish with a McLaren-Honda, but the real one." The track's stand-out feature is probably the back end of the paddock, where the vast concrete expanse behind the garages gives way to a series of pavilions dotted around a small lake, which the teams use as their offices for the grand prix weekend.